As my girls are getting older I'm finding that I am getting more and more excited about their gifts. MaeMae loves helping in the kitchen and I wanted to do something really special for her too (see previous post) so I made her this little chef hat and put together a cooking set for her. It all will go into a Tupperware and be stored in the kitchen for us to make special treats together. Or for her to just help with food prep for dinner. Poor girl has been throwing up all day though so we are all hoping she will be back to her normal spunky self before the big day. my kids threw up this morning, too. What the heck?! We just did the puke thing at thanksgiving. Hope they're all better tomorrow! The chef hat. I die. Totally making these soon. poor GM! I don't think I knew that she loved to cook and bake. Portia's my little assistant and has spent most of the time at my parents' house learning to make Christmas goodies, pies, and rolls. I love the chef hat. 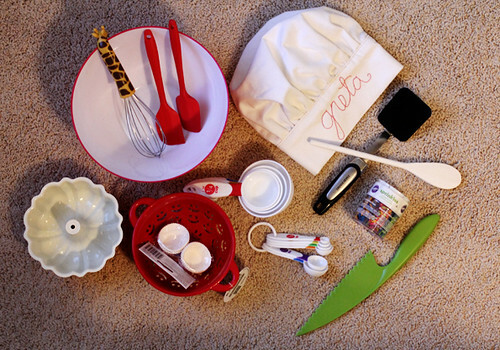 I started collecting stuff for Portia's birthday chef kit and, of c ourse, left them in AR. Hope she feels better!